The Ebola crisis has, according to the latest figures from WHO, reached more than 2600 dead from the virus in West Africa. An "exponential increase" is expected the coming weeks. 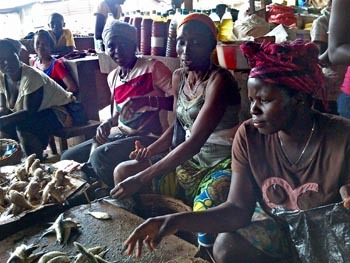 In Sierra Leone, the epidemic has caused a total break-down of health-care. 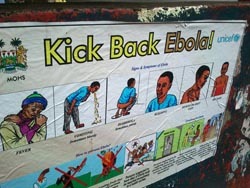 Hospitals are closed, doctors and nurses refuse to work due to lack of proper equipment, with no personal protection or education, could in the long run take a toll of far more killed than the Ebola epidemic, warn international doctors in Freetown, the capital. Slowly, very slowly are the rubber gloves carefully removed. -It is really very important, not to touch the outside, tells the instructor, Micaela from Italy..
A similar painstakingly careful procedure is the repeated with the wite plastic suit. 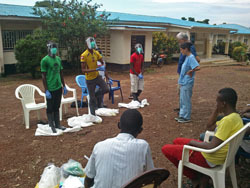 Ebola is definitely to be taken seriously and the twenty-something hospital workers, here for a five day course in personal protection methods, are by now aware of this. In the neighbouring yard, construction work of the second Ebola center in Sierra Leone is going on. So far, the only functioning center is in the eastern province of Kenema, one of the worst affected in the country. The capital Freetown has so far only seen 7 - 10 dead and maybe a hundred of suspected cases. 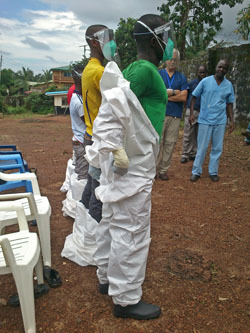 For the country, there are more than 500 dead, so another Ebola center is very well welcome. That means that those infected in the Western parts of the country, now have only a five or six hours journey to a simple treatment. The hospital workers, now undergoing the personal-protection course, will start working next week, and thus exposing themselves to the risk of beeing infected. -Ebola is really, really dangerous, but no, I am not afraid. 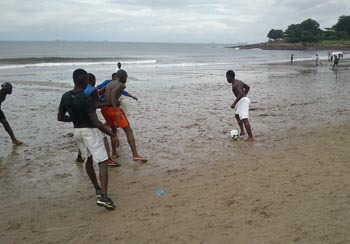 I promise to do my best to fulfill the work I have to do, says Alusyne Kamara, a young man in the twenties. I am shown around in the "center-to-be" by Michela Delli Guanti from the Italian organisation "Emergency", which is responsible for planning and construction of the center. 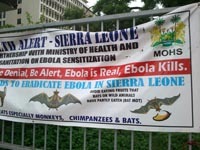 Not even this is the Sierra Leone authorities capable of.... The Ebola center will have a capacity of 28 berths. Concrete floors are beeing moulded, toilets are tiled and four tents, each with 5-6 berths are erected. -They stand in order of severuty of the cases, Micaela says. -The first tents are for suspected cases. They are surveilled and if the tests are positive, which means Ebola, they are transferred to the tents marked "Severe" or "Very Severe" There they will be treated, and later on referred to other treatment centers. The problem is only, such centers doesn't yet exists. -The situationen is serious and the authorities have no capacity, nor will or understanding of the problems, says Michela. I film the tents. Last in the row, furthest down, is a building, The sign says "Morgue". Outside some guys are shoiwelling a deep hole in the red ground. Some boys pass by, carrying baskets of earth on their heads and seem embarrased by my filming them. -Don't film us, Alesuine says, explaining that he is a student, like the others, and only works extra here. -We are not primitive like this, he says. That is in fact what they are, obviously, but what I understand from the continuing discussion, they are even more. -I don't believe in Ebola, he says to my surprise. -I only believe in what I see, and so far I haven't seen anyone dead by Ebola and means, like quite some other in Sierra Leone, that the epidemic is only an invention by greedy, local politicians to get support from naive, international donors. -In our culture, holding each other, shaking hands, were integral parts, but now, after the Ebola outbreak everyone are aware not to come in close contact with unknown persons, Mary says. -When we travel by bus, we don't sit close to another. In a taxi we are only two in the back seat and one in the front so everywhere now, people are cautious. 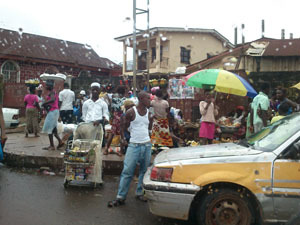 It is the rainy season and a sudden shower makes people seek refuge from the rain among the stalls. The market gets crowded. People are crammed among half-rotten vegetables, piles of spices and rice and newly slaughtered chickens. Behind a desk where hevily smoked fish-parts are piled, Mama Saio sits with her grandchildren. -We are afraid that the customers will touch us, or that we will touch them, she says. -All here are trying to avoid contact. But it is impossible not to touch someone, but then when you get home, you wash. When you see someone, you notice if that person is sick or not and that makes it easier to keep away, Mary, who is a nurse, says. 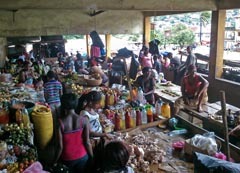 All efforts to reduce travel and transports in Western Africa could lead to a food crisis when trade is diminished. If this goes on, a svere shortage of basic foodstuff like cassava, rice and oil. And all restrictions and fears also contribute to a drastic rise in unemployment. It is Sunday afternoon. 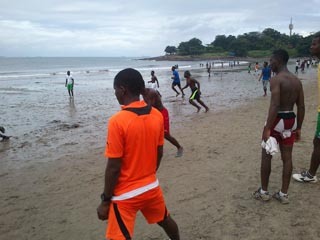 Lumley Beach in Freetown is not as crowded as usual. 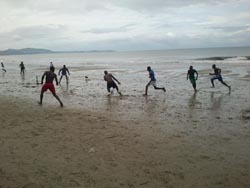 The Ebola epidemic has made just a few to dare come here and play fotboll, a game with an inheritant risk of life-threathening body contact. -People here see this as the only way to forget the stress we live under, Dennis Bangula says. -There are no other possibilities to meet. Some went to night-clubs but they have been told to shut down, as well as cinemas. Even the buses don't run as much as they used to. But the Ebola crises could well turn out to mean much worse. 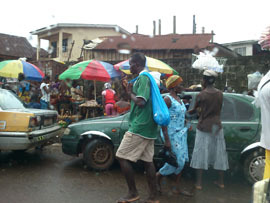 It has led to a total collapse of general health-care in Sierra Leone with 6 million inhabitants. 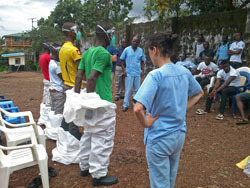 Bad equipment and negible education and training have ment that many doctors and nurses have caught ebola while treating patients. Therefore many have left their badly paid jobs. 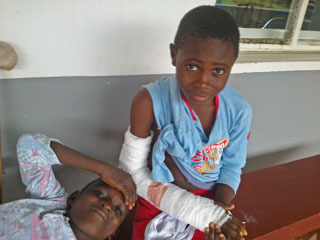 -Health care in a normal sense doesn't exist in Sierra Leone today. 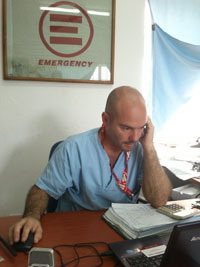 The main referral hospital, Connaught Hospital in Freetown now can only give some basic first-aid and con not recieve patients anymore, Luca Rolla, who is the medical coordinator at the italian "Emergency" organisation, says. -Since more than two months, no operations are beeing undertaken. 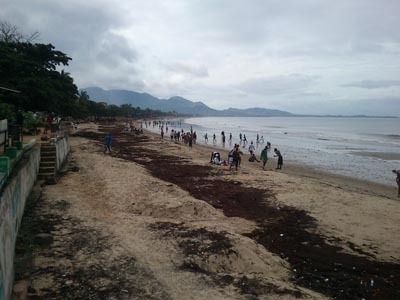 People don't dare go there after a doctor and a nurse died from Ebola. Their knowledge of virus protection and treatment is non-existent, so the situation is very, very serious, Luca Rolla says. ”Emergency” is now running the only fully functional hospital in the country, and is, of course, full. The hospital, with 400 staff, is of a western standard. -Even today, SIerra Leone is at the top when it comes to high mortality among children under five, and soon, for sure, it will reach the very top position.